Hardiness: USDA Zone 5 for roots and crown; top will die back during cold winters, but regrows every year. Size: 3-4 feet tall, with similar or somwehat wider spread. Plant habit: Deciduous, flowering, mounding shrub. Leaves: Dull gray-green during the growing season. Leaves emit a pleasant odor when rubbed. Fall color is dull yellow or orange-brown, at best. Flowers: Blooms on the new growth in mid to late summer. 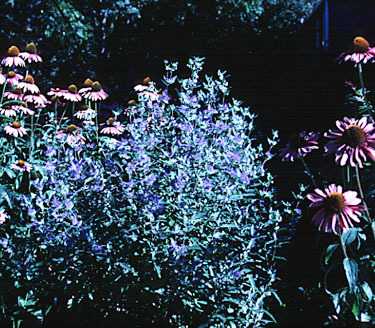 Flowers range from powder blue, through lavender to purple, depending on the cultivar. Flowers attract many bees and butterflies. 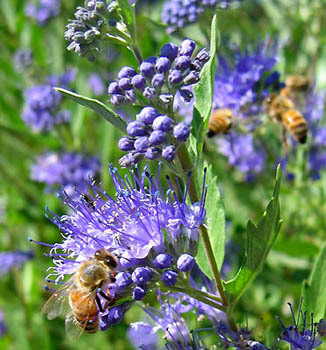 The flowers are so attractive to the bees, that the insects aren't bothered by the presence of people. These insects give an added dimension to the plants - sound and movement! Fruit: Off-white, papery fruit remain after the flowers fade. These can be attractive in winter. They also are a source of viable seed. Culture: Grows well in a wide range of soil types. Maintenance: Prune all branches to live buds or close to the ground in early spring to remove all dead wood above ground. If the winter was mild, and live buds are evident near the tips of the stems, then the plant may be left unpruned. The size of the plant during the growing season will vary, depending on how far back the plant is pruned. Seeds will produce new plants, so some people prefer to prune the tops of the plants off after flowers die in the fall; avoid this shrub if reseeding is a problem. Use: Combines well with Echinacea purpurea (as in photo at top), Rudbeckia spp., Sedum spectabile, and Teucrium chamaedrys, which also bloom in late summer. 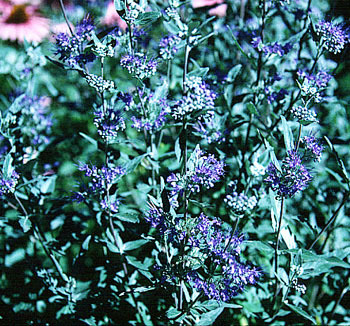 'Blue Mist' (photo above) has light blue flowers. 'Dark Knight' (photo on right) has deep blue to purple flowers. 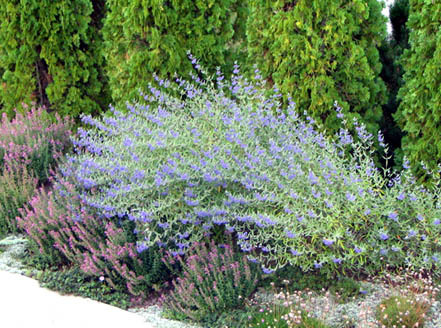 'Longwood Blue' also has lighter blue flowers. Dept. of Hort & LA, Washington St. Univ.